Area Agency on Aging, Region One and Today’s Caregiver magazine, (Caregiver.com), are honored that Governor Janice K. Brewer has proclaimed November as Arizona Family Caregiver Month. In true commitment to the support of caregivers within the region a special daylong training for family and professional caregivers called The Fearless Caregiver Conference will be held on November 12th in Phoenix at the Church of the Beatitudes. This event is presented by The Area Agency on Aging, Region One and Today’s Caregiver magazine ( http://caregiver.com ) since 1995, the nation’s leading support, training and educational organization for family and professional caregivers. The November 12th Phoenix Fearless Caregiver Conference at the Church of The Beatitudes will be the 141st Fearless Caregiver Conference seminar, expo and lunch held around the nation. The event is offered at no-charge for local family caregivers who register online at http://www.caregiver.com or who call 877-829-2734. Family caregivers can register for the limited number of complimentary caregiver tickets still available for the full-day seminar, exhibitions and luncheon sponsored by the Area Agency on Aging, Region One, Arizona Respite Coalition, Division of Aging and Adult Services and Today’s Caregiver Magazine. Arizona State Legislative Members, Representatives Kate Brophy McGee and Representative Heather Carter will receive the Community Fearless Caregiver Awards during this daylong conference. “Representative Brophy McGee and Representative Carter are recognized for their tireless commitment to supporting Arizona family caregivers is a model that should be recognized and celebrated and hopefully replicated by other state leaders around the nation,” said Gary Barg, Founder and Editor-In-Chief of Today’s Caregiver magazine and host of the Fearless Caregiver Conference. The Phoenix Fearless Caregiver Conference is dedicated to assisting family and professional caregivers who are seeking to speak directly with aging and disability experts, caregiver advocates, insurance advisors, Social Security specialists, elder law professionals, homecare and facility coordinators and support organizations. Fearless Caregiver Tour History: More than 60,000 caregivers have attended a Fearless Caregiver Conferences since Today’s Caregiver magazine started this tour. “We are excited about returning to Phoenix,” said Gary Barg, host of the Fearless Caregiver Conferences and editor-in-chief of Today’s Caregiver magazine. Upcoming cities include New Haven, Connecticut on November 6th, Miami, on December 3rd and The Villages, Florida on December 11th. Sponsorship opportunities are still available. Call (800) 829-2734 for information and to reserve your space. Established in 1995, Caregiver Media Group, http://www.Caregiver.com, has become the recognized media authority on caregiving through Today’s Caregiver magazine, Caregiver.com, the Fearless Caregiver Conferences, the award winning book – The Fearless Caregiver: How to Get the Best Care for Your Loved One and Still Have a Life of Your Own, as well as Caregiver Media Group’s award winning content and custom publications. Today’s Caregiver magazine contains cover interviews with celebrity caregivers, articles on caregiving issues and vital resources for all caregivers. Cover interviews have included Rosalynn Carter, Rob Lowe, Clay Walker, Elizabeth Dole, Debbie Reynolds, Della Reese, Nancy Snyderman, and Clay Aiken. 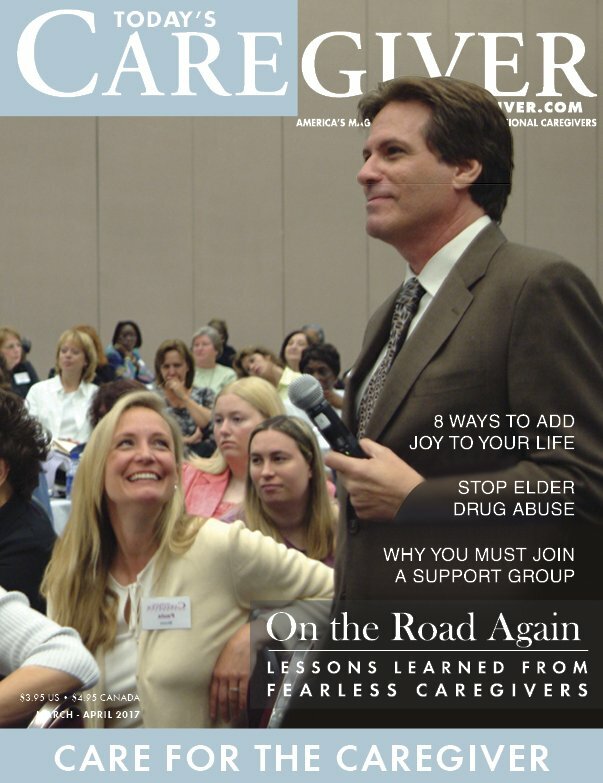 The digital version of the magazine is available free of charge at Caregiver.com.